From the Theist point of view, the conflict between Theists and Atheists is a struggle between Good and Evil. While Atheists view the conflict as more of a clash of Reason versus Superstition. Most Theists, either through indoctrination or misconception, think Atheism is somehow amoral. This mistaken conviction is based on the faulty premise that morality was created by God, Jesus, Mohammed, etc. However, this is simply not true. After 60 years of observing this conflict, I thought it about time someone wrote a comprehensive explanation, from an Atheist point of view, of why these two groups believe what they believe. Although I am an Atheist, I did not write this book to make fun of or condemn the true believers. Rather, I wanted to share my personal experiences and observations about God and the religious community in general. 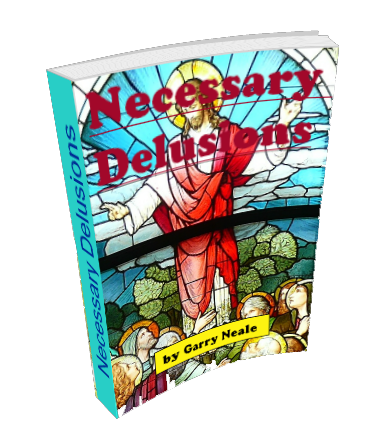 The resulting product is something that the Theist, the Atheist and the undecided reader will find interesting and informative. So who should read this book? The Theist will acquire an in-depth view of the Atheist mindset and a good understanding of why they even exist when it would be much easier to go along with the masses. It will also provide them with a comprehensive critical review of the major tenets and doctrines of their religion making for what some might call a "hard test of faith." The Atheist will finally have comprehensive source of reference material to use when asked why they are not Theists. But moreover, Atheists will learn why Theists believe what they believe and why there will always be Theists no matter how much science contradicts their views or doctrines. The Atheist will finally begin to understand that Theists are not ignorant, and that they actually have some very compelling reasons for maintaining their "necessary delusions." For those who are undecided or searching for the truth, you will understand why Theists and Atheist are both comfortable in espousing their beliefs. You will also learn about the allure and the problems with Theism, as well as, the reasons why both sides exist. While this book is a somewhat critical review of Theism, its true purpose is just to get people to think and to look at the world clearly, to assume nothing, to question everything and to enjoy the life we have, not the afterlife that will never come. Life can be a wonderful, exhilarating experience – and above all, it's real.